Lake Guard™ - BlueGreen Water Technologies Ltd.
For decades, scientists have been struggling to introduce different solutions to toxic cyanobacterial blooms (aka blue-green algal blooms). The tension between efficacy, collateral damage and cost resulted in a handful of very limited products. At the same time, the frequency and scope of harmful bloom episodes increased worldwide at alarming rates. The Lake Guard™ was designed to fuse market-approved, well-validated algaecides with a novel delivery mechanism thereby removing all pre-existing limitations in terms of feasibility, affordability and eco-friendliness. Currently, H2O2 and CuSO4 are applied subsurface in a liquid from over the entire waterbody, usually by means of specially designed, GPS-guided boats or rafts, operated by experts. the The Lake Guard™, on the other hand, coming in a granular form and requiring no special preparation, is readily available to be dusted manually, from the shore, a boat or from the air, depending on the size of the lake. It does not require a full lake application, rather should be administered upstream, leaving it to the winds and currents to distribute it precisely along cyanobacterial aggregations. This translates into a very short lead time, even in places where the Lake Guard™ is not stocked. Ideally, the Lake Guard™ can (and should) be administered prophylactically, using minute quantities regularly – thus preventing the occurrence of blooms altogether. As no special equipment or any expertise required for applying the Lake Guard™, and considering its ease of application, operational costs and the risk to the operators are now reduced to a fraction. The current practice of using GPS-guided boats to inject liquid CuSO4 and H2O2 subsurface dramatically limits the size of areas that can be treated. In the US, for example, the largest areas treated this way are limited to 3-4 km2. The Lake Guard™ , on the other hand, can be used irrespective of size and scale. It can be mounted on a boat or a plane and dusted over large areas. Again, a unified application is not required – all that is needed is to drop the entire load in strategic, upstream locations and let nature do the rest. 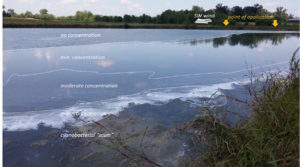 Current subsurface whole-lake application translates into high volumes of algaecides implemented indiscriminately throughout the entire waterbody and water column. Furthermore, the long lead time from decision making, through mobilization of equipment and men to the long and slow actual application, result in the subsequent intensification of the bloom pre and during treatment – thus requiring a higher dose of chemicals. The Lake Guard™, on the other hand, travels from the point of deployment (upstream) downstream autonomously, carried by the currents, along cyanobacterial cells and forms a perfect spatial formation around cyanobacterial aggregations. This means that throughout the process the Lake Guard™ can create an optimal exposure-ratio between algaecide/cyanobacteria-cells – which results in the need for a much lower effective dose. Lower dose = lower environmental footprint. Slow-release = lower effective concentrations at any given moment. Floating formulation means that effective concentrations are limited only the surface and to areas where cyanobacteria is abundant = no effective concentrations upstream. This is important as current guidelines of these compounds in the US prohibit full lake application in one day (even when this is feasible) in order to provide living organisms a “safe haven” in untreated areas. This is irrelevant in the case of the Lake Guard ™ since effective active concentrations are limited spatially and living organisms can find “safe haven” in deeper waters as well as upstream. When used prophylactically, much lower doses are needed and the realization of a full-scale toxic bloom is avoided altogether, along with its independent environmental adverse implications. The Lake Guard’s formulated coat itself is inert, biodegradable, has no effect on the environment, and leaves no trace in the water within 24-36 hours.